In Boston, white women make 83 cents for every dollar that men make, according to the city. Mayor Martin J. Walsh waded into the controversy surrounding the gender wage gap Tuesday, announcing that he was set to launch an unparalleled effort to collect salary data from businesses throughout Boston, and that he had boosted the salaries of two top women on his own staff. The city is preparing to analyze the wages of male and female employees at more than 60 local companies — a step officials say is the first attempt in the country by a major city to tackle the gender wage gap by examining and releasing actual salary information. “We know that the wage gap continues to be an issue all across this nation, and it’s time to stop talking about it and start taking action,” Walsh told an audience at the inaugural Boston Women’s Venture Capital Summit in the Seaport Tuesday morning. Employers, from Putnam Investments to Blue Cross Blue Shield of Massachusetts, have agreed to anonymously supply average wages, broken down by gender, race, job category, and length of employment. The city pledges to make the information public this summer. 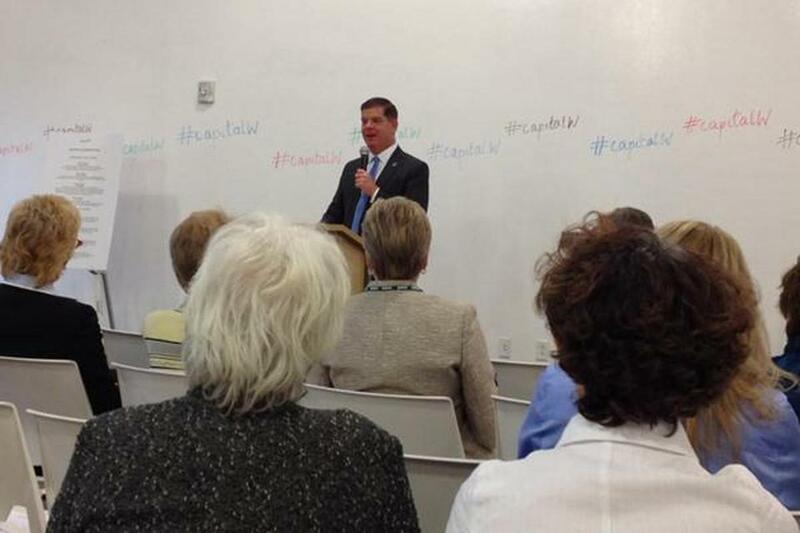 Mayor Walsh opened the Boston Women’s Venture Capital Summit by acknowledging a wage gap in his office. In Boston, white women make 83 cents for every dollar that men make, according to the city. The gap is far worse for women of color. Nationwide, women make 78 cents per every dollar a man makes. The salary information the city is seeking will reveal more detailed comparisons, such as the average wage of African- American saleswomen versus men in the same positions, and how their salaries change over time. The data will be released in early summer, in conjunction with options to shrink salary disparities, such as offering flexible hours, mentoring programs, and gender sensitivity training, and making an effort to hire and promote women into higher-level positions. “We’re not trying to punish companies, we’re trying to have people understand where they’re at,” said Megan Costello, executive director of the Mayor’s Office of Women’s Advancement. So how do you persuade a major corporation to unveil sensitive salary information that their competitors would love to get their hands on? By keeping it anonymous. Even when the aggregate salary information is made public, the companies attached to specific data will not be revealed. Azer Bestavros, a Boston University computer science professor who developed the software encryption that will be used for the project, said it is essential to keep the information private, not only for proprietary reasons but to avoid liability. If anyone outside the company had access to the salary data, Bestavros said, he or she could potentially be subpoenaed to reveal it. The city is planning to unveil the software to participating companies at a wage gap conference next week and plans to start data collection later this spring. Tuesday morning, Walsh made it clear that he is determined to lead by example. The mayor said he noticed a significant wage gap among top staffers at City Hall when he was reviewing a draft report from his new Office of Diversity. With the addition of several new senior staffers, Walsh’s cabinet will have five women and 13 men. According to a Globe analysis of payroll data, men in Walsh’s cabinet are paid, on average, nearly $156,000, while women in the cabinet earn $123,000. To help close the gap, Walsh gave a 12 percent raise to his chief of policy, Joyce Linehan, whose pay increased to $140,000 from $125,000. Laura Oggeri, the mayor’s spokeswoman, received a 15 percent pay hike, increasing her annual salary to $116,000 from $101,000. Despite the pay increases, women in Walsh’s cabinet will still be paid almost $27,000 less than men, on average. News of Walsh’s action spread quickly in Boston’s highly connected tech community. Shereen Shermak, chief executive of the Boston venture capital firm Launch Angels, was scheduled to lead an afternoon coaching session at the summit, but after the mayor’s remarks “blew up my Twitter feed” she headed over early to make sure she wasn’t missing anything. Several factors contribute to the wage gap. Many women take time off or cut their hours when they have children, slowing their career trajectory. Women also tend to go into lower-paying careers. But an implicit bias makes the divide even wider, analysts say. Previous attempts to address the wage gap have largely been limited to legislative proposals, including the federal Paycheck Fairness Act, which would increase pay transparency and require businesses to justify pay grade differences. A bill filed in Massachusetts earlier this year would prohibit employers from seeking job candidates’ salary histories and require that minimum pay be disclosed for advertised positions. Analyzing the gender wage gap is a complex undertaking, said Kathy Horgan, chief operating officer for global human resources at State Street Corp., one of the companies taking part in the city’s wage gap compact, noting that one of the sources of salary disparities at the Boston financial services company appears to be a lack of women in senior positions. “That’s where we don’t have the kind of representation of women that we want to see, and we do believe that’s a driver of our wage gap,” she said. Andrew Ryan and Callum Borchers of the Globe staff contributed to this report. Katie Johnston can be reached at katie.johnston@globe.com. Follow her on Twitter @ktkjohnston.